EA has unveiled that the Jedi master OBI-WAN KENOBI is finally coming with the Battle of Geonosis update that is coming to the STAR WARS BATTLEFRONT II on November 28. 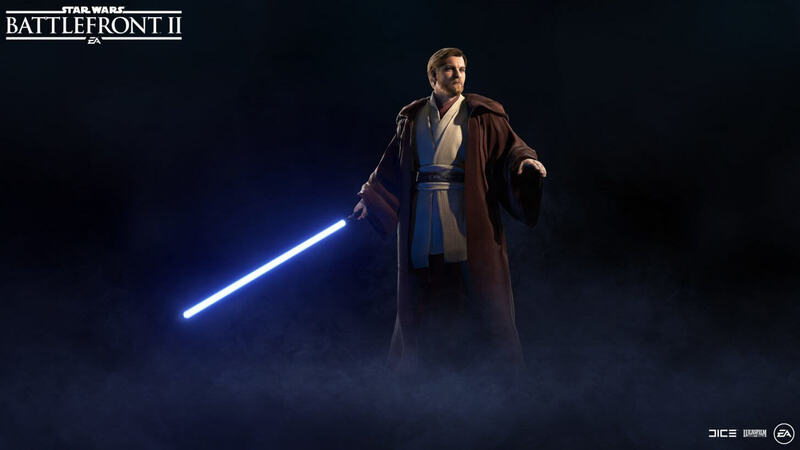 EA has also provided the essential detail of the character like the abilities and the different appearances that the Obi-Wan Kenobi will have in the game. Check out the details below. "Wielding his trademark lightsaber beaming with blue, and reflecting his mastery of defensive combat, Obi-Wan’s blocking skills are superior to any other Jedi in the game. His stamina and near perfect defense are joined by powerful, chained melee attacks. Messing with an opponent’s head is a bit of a specialty of Obi-Wan’s, and this is showcased with the Restrictive Mind Trick Ability. The mind trick disrupts the target’s Abilities for a short time – including dodges! Use it wisely to outsmart your enemy. To sum things up, Obi-Wan Kenobi is composed, defensive, and a true master of the Force." The Jedi master will appear on November 28 with the default appearance. Those who want other appearance of the Jedi master can purchase "The Robed Appearance" that is also coming on November 28 with Credits or Crystals. Commander of the 212th Attack Battalion, the General Kenobi Appearance will also be coming, but the date is not announced yet. Star Wars Battlefront II is available for PC, PlayStation 4 and Xbox One.